Our organization preserves and presents the rich heritage of the wonderful community comprising the areas of Arden, Eagle Valley, East Village, the Hamlet, Southfields, Sterling Forest, and Tuxedo Park. The Tuxedo Historical Society's mission is to foster awareness of the community's heritage by collecting, preserving and exhibiting materials and presenting programs that document life, past and present, in the Town of Tuxedo and its communities. Our goals as we reorganize are to find ways to increase our funding, stir up the interest in the community, increase our membership and keep the community involved, informed and interested. 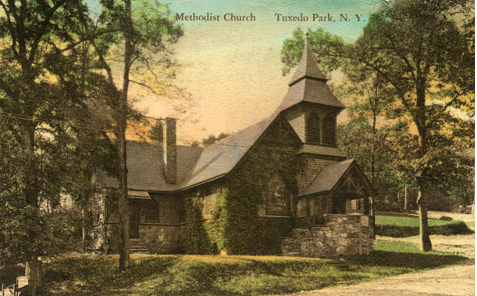 The Tuxedo Historical is a non-profit 501(C)3 organization formed in 1982 and located in the former historic Methodist Church at 7 Hospital Road, Tuxedo Park, NY 10987. The logo was designed by Ernie Barth, a former Clinton Woods resident. The original color was tan and was chosen by Jackie Kornfeld, a Tuxedo Historical Society founder. The chain links represent the iron industry which was prominent in Tuxedo during the American Revolution. A well-known product of this industry was the chain placed across the Hudson River at West Point. The tree, oak leaves, and acorns represent the Tuxedo forest which is primarily comprised of oak. 1982 is the year the Tuxedo Historical Society was founded.